The Mammoth Community Water District’s Robert Motley, Plant Maintenance/Instrumentation Supervisor, is being recognized by California Water Environment Association (CWEA) as the 2017 Electrical/Instrumentation Person of the Year. Rob started with the MCWD as a contract employee in 2001 and became full time in 2009. The Plant Maintenance Department, which Rob supervises, is responsible for the maintenance and repair of all electrical equipment including automated industrial control systems, pump motors, industrial communication systems, water and wastewater treatment plant equipment, and general building maintenance. 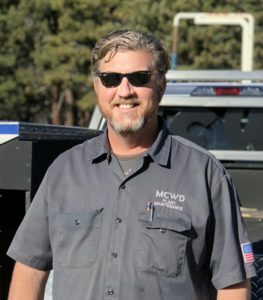 “Rob enjoys and takes pride in improving the infrastructure of MCWD facilities; he has a knack for understanding where upgrades are needed throughout the system and how to implement them. I enjoy coming to work every day, a big part of that is because of his influence, depth of knowledge, and willingness to share it with the rest of us,” said Keith Weiland, who has worked for Rob for over nine years. Rob’s excellence will be recognized by the CWEA Sierra Section at the Installation and Awards Banquet on February 17, 2018 at the Tamarack Junction in South Reno.